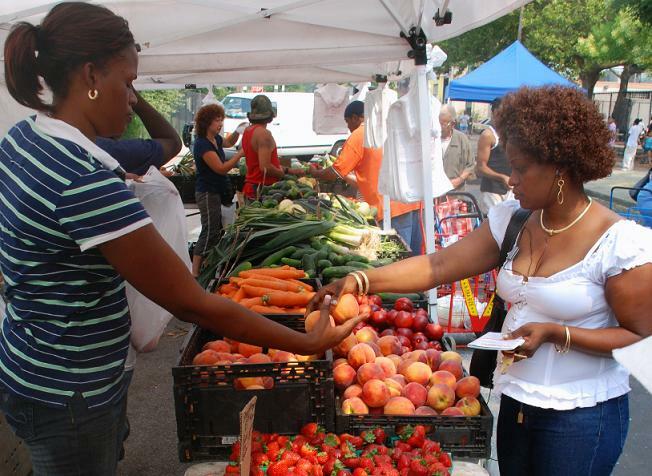 In 2009, the Project for Public Spaces (PPS), with support from the Robert Wood Johnson Foundation and in partnership with Columbia University, undertook a study to examine what market characteristics successfully attract low-income shoppers. The study also explored the obstacles that may prevent low income individuals from shopping at a farmers market when one existed nearby, and how youth-oriented market programming affects healthy eating habits among kids and teens. Today, we are thrilled to share with you the results of this study, and to offer recommendations for everyone working to get more healthy food into their communities through farmers markets. For the study, our team examined eight markets across the United States that served low- to middle-income communities with higher than average ethnic and minority compositions. Each market had unique attributes that identified them for selection. In addition, each market was a previous recipient of a PPS grant, funded by the Kellogg Foundation, which offered technical assistance between the years 2006-2008 in addition to funding. Out of our analysis of market management data, tracked over several years and surveys of market shoppers and non-market shoppers, we were able to identify two key trends. First, we found that price is not a barrier. Among the survey sample, almost 60% of farmers market shoppers in low-income neighborhoods believed their market had better prices than the grocery store. Among those who did not shop at farmers markets, only 17% cited price as a barrier to shopping at their local farmers market. Second, we learned that information is key. Unlike a grocery store, markets typically lack permanent structures and are therefore more ephemeral by nature. Shoppers need better access to information about schedules and seasonal changes in order to become more regular market shoppers. One of the most important lessons learned from the focus groups with youth interns at the markets was that the end goal was to produce excellent citizens, not necessarily urban farmers. While eating well, advocating for food justice, and increasing the youths’ knowledge of the local food production process were all taught, it was the emphasis on leadership, personal development, and responsibility that ultimately made the programs successful and left the strongest impact on the youth surveyed. Location, Location, Location – A common reason cited by non-market shoppers for not patronizing a farmers market was the need to complete their shopping at one location. While it is unlikely that farmers markets will be able to serve that function, positioning markets in locations that give the appearance of one-stop shopping may overcome this access barrier. Also, given our experience with the transformative power of successful Placemaking, we advocate that market operators who are serious about long term sustainability turn their market into a destination. The market should not only be a place to buy produce, but should incorporate programming that integrates the market into the fabric of the surrounding community. Know your shoppers – One of the most interesting emerging trends from our data was the varying intensity in market use depending on the income of shoppers. What this tells us is that knowing your most frequent shopper, as well as the shopper demographic who purchases the highest percentage of their produce at the farmers market, is important for markets to achieve financial sustainability and develop a more stable consumer base. Knowing your shoppers has implications for both the kind of marketing and the location of marketing that the market should produce. Markets targeting a low-income customer base must partner with organizations that share the market’s goals – Partnering with neighborhood organizations helps facilitate better outreach efforts to the intense-use shopper, as previously identified. Furthermore, if the market could operate through an existing organization that shares its mission there is a potential cost sharing component in terms of office space, co-promotion and community recognition. Farmers Markets need to expand marketing and outreach efforts to reach consumers – We recognize that many market organizers are already well aware of the importance of successful marketing for the success of their farmers market. However, the data from this study re-affirms the need for constant marketing and outreach to local consumers to educate them about the location, time, and acceptance of SNAP and WIC benefits. Click here to download a PDF of the publication!